It’s Generations X and Y’s lot to feel prematurely long in the tooth. That sensation has all sorts of contributing factors: The shortened lifespan of pop-culture trends, online superstars who are complete unknowns IRL, and nostalgia enabling Internet outlets, to name a few. It’s incredibly telling that one of the defining pop songs of the last decade concerned feeling the breath of a cooler, younger generation on the back of your neck. Never mind that “Losing My Edge” allowed a then-32-year-old James Murphy to reclaim his rock-scene anxiety and channel it into a three-album cycle about getting older with grace, perspective, and a killer beat. There are two ways to interpret that track: It’s either a piss take at the fallacy of eternal youth, or a confirmation that, yes, that kid in the chunky frames and garish hoodie is coming to steal your record collection and all the cultural cachet that comes with it. Though who even owns records anymore? In “Neighbors,” Jess and Schmidt represent different facets of that latter interpretation. 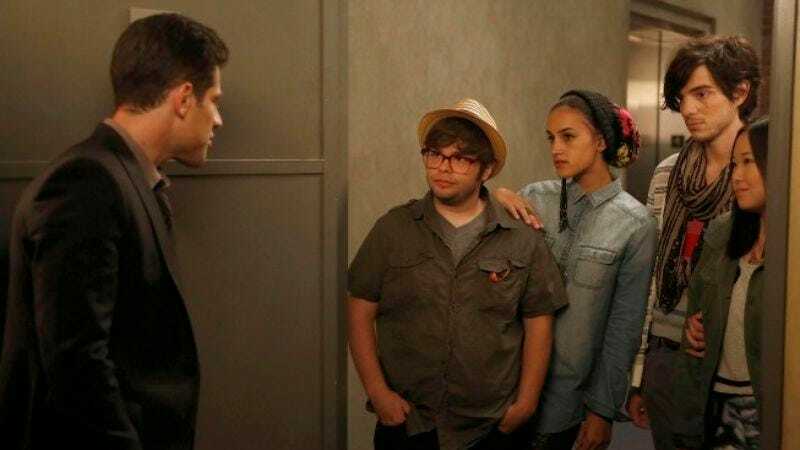 When the roommates are introduced to the hula-hooping, quinoa-eating, pan-ethnic, pansexual quartet that’s moved in down the hall, it’s like they’re staring through a portal to an alternate dimension. A hipper, younger, terrifying dimension. To Nick Miller, future star of the film adaptation of Crankshaft, these new tenants pose no threat. In fact, they push him to heretofore unseen levels of drive and ambition: Seizing upon Schmidt’s adverse reaction to the new neighbors’ blasé attitudes and implied bed hopping, Nick adopts a personal quest to prank Schmidt into feeling like an old man. In the most inspired storyline of “Neighbors,” convincing Schmidt that he’s deaf, shrinking, and incontinent has an anti-aging effect on Nick, who derives at least $1,200 (and, at most, $1,300) worth of youthful joy from torturing his roommate. It’s as if the writers took note of Jake Johnson’s affinity for Bill Murray and threw the guy a plot that would do Tripper Harrison proud. Jess and Schmidt’s side of “Neighbors,” meanwhile, is less “Meatballs Bill Murray” and more “post-Wes Anderson Bill Murray.” It’s much more contemplative over there, despite the cartoonish post-grads slumped in the corners. The duo’s short-lived friendship with Chaz, Fife, Sutton, and Brorie is a one-off connection that never really clicks—it doesn’t help that the four newcomers aren’t so much characters as they are props draped in thrift-store clothing and absurd affectations, designed for the express purpose of teaching the protagonists a lesson. If there was a lesson taught by last week’s episode, it’s this: The best New Girl episodes are the ones where the main ensemble drives the story. Despite their lack of definitive traits and memorable lines, the new kids hijack every scene they’re in, and they don’t offer new insight into the principals—they merely move Jess’ post-layoff story forward. Her declaration that she can’t hang out with the youngun’s anymore is abrupt, but welcome, as it signals a move to a third act where the characters can get at the heart of what’s really going down in apartment 4D: Schmidt feels like Jess has given up, Jess feels like Schmidt is judging her, and everyone can agree that the advantages of being young, beautiful, and unacquainted with proper waste disposal are outweighed by being slightly less young, beautiful, and permitted to rent a car. That’s been fruitful thematic territory for New Girl in the past, but the material about maturing and accepting responsibilities rings mostly hollow in “Neighbors.” Within the space of 22 minutes, the neighbors can only talk about their lack of drive, and we have to take it as truth and compare it to what we know about Jess, Schmidt, Nick, and Winston. They’re a yardstick, lines drawn on the wall against which Nick’s escalating series of practical jokes and Winston’s mortality-inspired ambition can be measured. These characters serve a purpose, but they eat up an awful lot of screentime in doing so. “Neighbors” is haunted by the same kind of footsteps James Murphy heard every night in 2002. As they did for Murphy, those bumps in the night spur Jess into action—but down the line, it’ll be best to ignore that type of noise. 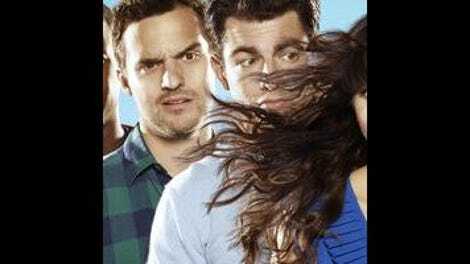 Yes, fine, the epigram isn’t 100 percent accurate, because New Girl takes place in Los Angeles. The “unremembered ’80s” bit was just too good to pass up—even if it’s unlikely that people born in 1989 would be unfamiliar with catchphrases from Family Matters or Full House. Both shows would’ve been in heavy syndication rotation during the character’s pre-teen and teenage years. Maybe not owning a TV has always been a way of life for those four. There’s a flash of a reaction from Zooey Deschanel after Schmidt’s “I’m like Snow Leopard; you guys are like DOS” line that I wish was given a half-second more to breathe. The roommates ought to be allowed to enjoy one another’s company as much as the casts of Cheers or How I Met Your Mother. Who else wants to see the workplace sitcom in which Winston is starring beyond the frame of New Girl? At the very least, it has to lead to a Go On crossover where Lamorne Morris and Matthew Perry fight for the attention and affection of sports fans in the L.A. area. Once Winston moves up from “primetime for truckers,” that is. If the “Neighbors” cold open and the September 21 episode of the Harmontown podcast are any indication, this fall’s No. 1 ’80s sitcom impression is Willie Tanner, the ALF patriarch played by Max Wright. Theory from the Adams’ household: Jess will never see Nick’s prank coming because she’s already missed it: He’s just kidding about the $1,200 to $1,300 he spent on fake contact lenses and the like.